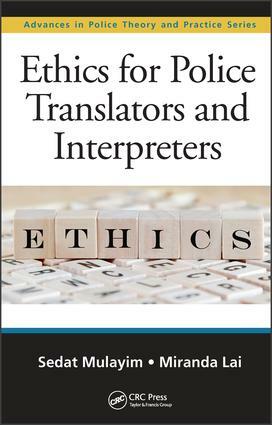 This book examines the major theoretical foundations of ethics, before zooming in on definitions of professional practice and applied professional ethics, as distinct from private morals, in general and then focusing on professional ethics for translators and interpreters in police and legal settings. The book concludes with a chapter that offers a model for ethical decision making in the profession. Sedat Mulayim is the discipline head of translating and interpreting programs at RMIT University, Melbourne, Australia. He has a Master of Arts (Translation Studies) by Research degree and has undertaken PhD research in public service translation and interpreting. He has developed and delivered training programs for interpreters in legal and police settings in Australia and overseas. He has also produced resources for other professionals on how to work with interpreters.He is a certified interpreter in the Turkish language and has more than 20 years of experience in interpreting in police interviews and courts. His research interests include police interpreting, global security issues in multilingual settings, public service translation and interpreting, and ethics. Sedat teaches Ethics and Professional Issues in the Master of Translating and Interpreting Program at RMIT University. He is also the chair (since 2000) of the Turkish Examiner Panel in the National Accreditation Authority for Translators and Interpreters (NAATI), which is the national certification authority for translators and interpreters in Australia. Sedat is the lead author of Police Investigative Interviews and Interpreting: Context, Challenges and Strategies. Miranda Lai is a lecturer and trainer in interpreting and translating at RMIT University, Melbourne, Australia. She is undertaking her PhD research into PEACE police interviewing mediated by interpreters. She has developed and delivered training programs for interpreters in Australia and overseas. She is a certified interpreter and translator in the Chinese language and has many years of practice experience. Her research interests include investigative interviewing in multilingual settings and public service translation and interpreting. Miranda is coauthor of Police Investigative Interviews and Interpreting: Context, Challenges and Strategies and is a member of the Chinese Examiner Panel in the National Accreditation Authority for Translators and Interpreters (NAATI), which is the national certification authority for translators and interpreters in Australia.